Recently, a potential client asked me for some information on Conversion Tracking. After responding, I began to wonder how detailed the explanations given by online marketers are. A Google search and some reading later, I discovered that Conversion Tracking is rarely defined well and in-depth. This post is essentially my response to said client. However, it is my hope that it answers some questions in detail and removes any mystery associated with the topic. 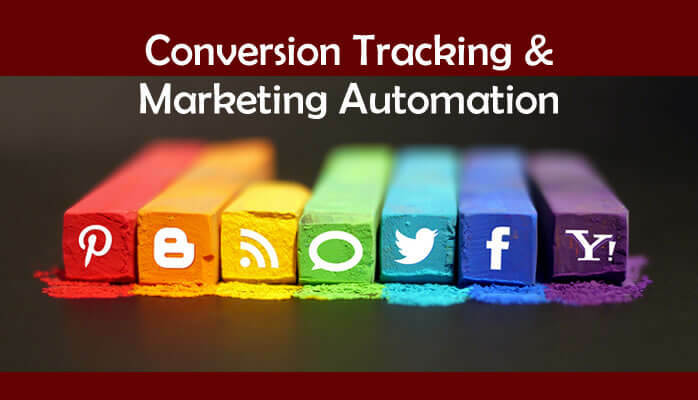 What are Conversion Tracking and Marketing Automation? In short, Conversion Tracking allows online marketers to identify behavior best within your audience to meet your goals, whether they are to drive traffic for a particular purpose – a contest or promotion for example, or to sell a product or service. Since marketing goals vary widely, a sale is not necessarily a definition of a conversion. Let’s dig into the details. Fundamentally, the goal of Conversion Tracking is to use applications, analytics, and if/then capabilities. As an example, a customer in audience X buys Y product. Automatically, a marketing email goes out for the Z campaign. The benefits of such automation are self-evident. I am always looking to create the most personal experience possible with a brand while automating as much of the “grunt work” as possible. My time and energy are better used focusing on marketing strategy and execution rather than rote duties. Marketing automation varies by platform. For example, there are many ways to automate posting content to various social networks at the same time, by a particular campaign, and sharing specific goals – think of a fall clothing collection, then a subset of related styles and accessories which can be marketed together and in a logical sequence. Automation makes the posting, data gathering, engagement breakdowns, etc. much easier. Remember, it still requires the work to setup the specific campaigns, ads if applicable, emails to segments, posts, etc. However, instead of ever guessing, we can now know the link clicked, where the person came from, how long they were on your website, for example, and much more. Multi-posting is the practice of posting the same or similar, content to numerous social media outlets. Great examples of tools that facilitate this are Buffer, my preference, and HootSuite. Both platforms and others provide analytics in addition to pure posting capabilities. The conversion is a specific action taken by individuals in an audience or groups therein that exhibit similar characteristics and/or attributes. Conversion tracking also allows us to understand why consumers engage with your brand, or in some cases not engage (which can be precious). For example, we send out 30K emails in our campaign. 15K are opened in this campaign. 3K people click on product A and 4K people click on product B. Now, we can understand how the customer got to the web page via the email or site link. Did they purchase a product (one type of conversion)? Did they go to the promoted link, but visit other pages and buy another item (a related conversion)? Did they save a product to their shopping cart? The sales history is vital; many people do not buy the first time they encounter a product. Conversion tracking describes the behavior of people that click on links or engage in any way with your brand online, whether it is in social media, your website, a contest, etc. The goal is to understand audience behavior and to use that knowledge to make people more likely to buy something. When they show interest but don’t buy, now we can reach out to them again with a better understanding of how to sell to them which is another conversion type. Many tools are used to measure different types of conversions, and various audience metrics – what pages did people click on, was it in a particular pattern, did they gravitate to a specific product, time, event, etc. Probably the most known tool to the public is Google Analytics. Google’s tool measures far more than traffic, it measures behavior as well as being capable of retargeting the visitors to your site. Conversion tracking is where the fun begins. Now we can advertise to only the people that have demonstrated an action towards our brand! There’s no guessing. Retargeting trims most of the fat out of advertising online by being surgical in its precision! The best part, there are many ways to leverage retargeted advertising across all areas online: search, Facebook, Twitter, YouTube and Google network specific, and more. If you have not worked with retargeted campaigns before, the “magic” happens by installing a small script across specific, some, or all of your Website pages, videos, or social media channels, which registers that a customer clicked through to the page. While aspects of the technology may seem invasive, I can assure they are not. Retargeted ad scripts do not identify individuals precisely. Rather, they correlate a visitor based on their behavior and allow marketers to serve advertising that is more relevant. Targeting is done by a code string that resembles gibberish. However, said nonsense makes it possible to serve ads to folks interested in the brands we market. Does working with this automation feel distant and removed from people? I often hear this question. It’s the opposite. Marketing Automation, Conversion Tracking, email marketing, and retargeted advertising greatly help me make the brand experience meet the customers’ expectations. Additionally, understanding the behavior and habits of your audience is the best opportunity to optimize websites and social media, especially for online businesses. It greatly helps channel ad spend to reach customers that are interested in your brand. With knowledge, we can begin to drive behavior based on customer response to campaigns and the actions they will most likely take. It’s the most exciting and fascinating aspect of my work. I have always chosen to work with niche brands because I find the audiences fascinating. Everything above, are merely tools that allow me to connect folks with the brands, products, or services that reflect the audiences’ values, beliefs, and tastes. It just happens to be that we now have the technology to make the process infinitely more accurate, efficient, and beneficial for brands and consumers alike.